Is this the future of handheld consoles? 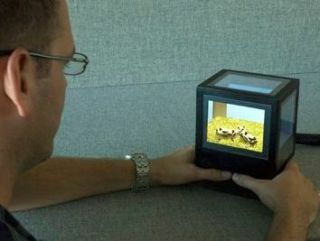 Researchers from the University of British Columbia have designed this new personal cubic head-coupled 3D display which allows you to play around with and manipulate 3D scenes from multiple angles. Could this new tech point the way to what we might see in the Nintendo 4DS in 2015 perhaps? You can interact with the cube in 4 different ways – you can view a static 3D scene, navigate through a large landscape, play with colliding objects inside a box or use a stylus to manipulate objects that look like they are truly within this magic cube. Billy Lam, Ian Stavness, Ryan Barr and Sidney Fels are the researchers who have designed a this impressive new 3D cube, called, rather strangely 'the pCubee'. Check out the pCubee in action in the video below. And imagine the possibilities for gaming and other applications that this kind of tech could be used for. You can see more details over on the pCubee site.